A false flag conspiracy about the Orlando shooting held that Google News carried word of the incident several hours before it actually took place. 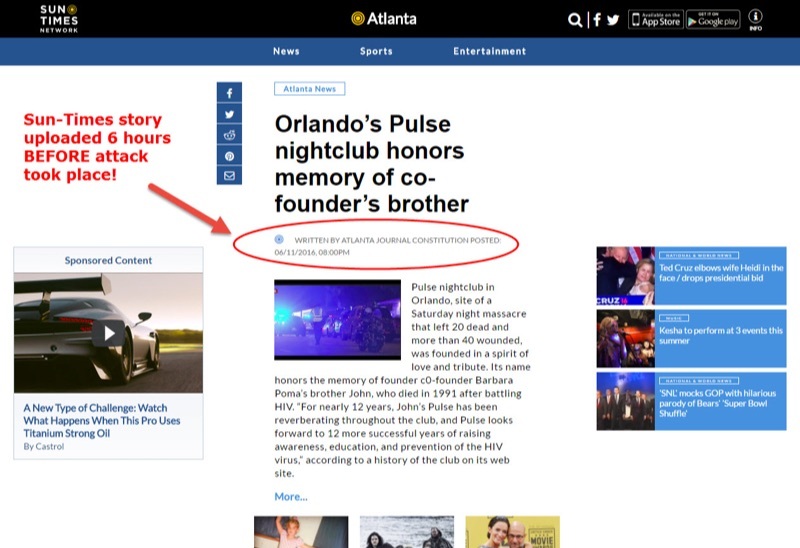 The Google news search engine picked-up an Sun Times Network article about the attack at an Orlando nightclub 6 hours BEFORE the attack took place! The attack occurred around 2:00 AM eastern US time on Sunday, June 12. As you pointed out, the story in question is an aggregation from the Atlanta Journal Constitution. We aggregate content from RSS feeds and through a method called scraping. When we do scrape, we rely on the timestamp of the source article. Sometimes the source article does not include a timezone and by default, our systems assumes and applies a GMT timezone; In this case it resulted in timestamping the aggregated post on our site to the day before the tragedy even took place. It's a flaw in the system that we are working to correct. Beginning in late 2015, Superstation95 began spreading alarmist hoaxes and conspiracy theories on social media, often building upon legitimate tragic or frightening events with embellished (and frightening) details. Among the most widely spread were claims that a large group of Muslim men fired upon campers and hikers in California, Fukushima radiation caused severe mutations in marine life, cargo ships mysteriously ground to a halt signaling imminent economic catastrophe, a deadly Las Vegas strip car crash involved a driver shouting "Allahu Akbar," the San Bernardino shooting occurred because the shooter was offended by pork served at a holiday party shortly before the massacre, the Earth's "magnetosphere" collapsed for two hours, and a (nonexistent) suicide note left by a genuinely deceased ICE agent warned of impending FEMA camps and mass enslavement. None of Superstation95's tragedy-milking predictions have ever come to fruition.